I admit.. I HAVE a problem.. with Jennifer L. Armentrout! They say the first step of receiving and accepting help is to admit yourself you actually have a problem. So I'm taking it upon myself to admit now I have a problem and I hope everyone accepts me as it is really quite hard to speak about! 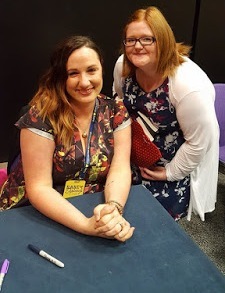 I have a real crazy, obsessional, maddening, fan girl problem with.. Jennifer L. Armentrout and her writing..
Signs of this problem you may ask? Yelling at your father because he didn't have a clue what a LUXEN was! Like say wha? Not going to sleep in two days because YOU HAVE to stay up and read all the LUX series..
Having to wait FIVE FRICKING DAYS for the final book in the Covenant series.. Putting on about a million stone because you're to upset with waiting and eating buckets of ice-cream while watching Bridget Jones..
Not venturing outside of your house for one week because duh reading is more important..
writing a blog post describing how obsessed with you are with the authors writing.. I admit I may have a slight problem.. but I'm NOT crazy! Repeat NOT CRAZY!! So I am asking does anyone else out there have the same problem and how do you help yourself? I don't think it's fair that Jennifer L. Armentrout writes such obsessional, addictive, page turning, amazing, hot alien/sentinel characters, perfect love stories, happy tear worthy moments, pouring your heart out as well moments, fantastic scenes, phenoma-bubble stories! Like how does this one woman actually come up with this stuff? Seriously? Maybe I should rein it in a bit now.. eh? I need to go continue reading NOW!